Ringrose limped out of Leinster's victory over Ulster on Saturday. 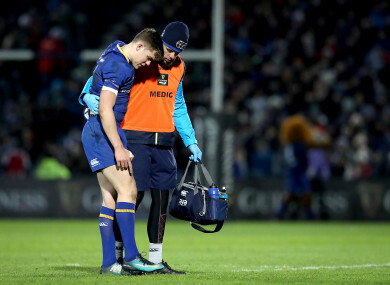 GARRY RINGROSE WILL miss Leinster’s final two Champions Cup pool games, and is in a race to be fit to play some part in Ireland’s Six Nations campaign, after undergoing ankle surgery yesterday. The 22-year-old centre suffered syndesmosis disruption of the ankle during the second half of the province’s Guinness Pro14 victory over Ulster on Saturday, and now faces another period on the sidelines. Ringrose, who is only just back from a five-month layoff following shoulder surgery in the summer, sustained the same injury which has also ruled Isa Nacewa, Josh van der Flier, Dan Leavy and Barry Daly out at different stages already this season. The Ireland international had played four games since making his comeback against Treviso in November but suffered the cruel blow when he twisted his ankle and landed awkwardly in a tackle in the recent inter-pro at the RDS. While he’ll definitely miss Leinster’s European games against Glasgow Warriors and Montpellier over the next two weekends, Ringrose will be out of contention again when Ireland open their Six Nations against France in Paris on 3 February. Leinster say he is looking at a recovery period of between five and six weeks — although Daly missed nine weeks with the same injury — meaning Ringrose will be struggling to be back in time for the home games against Italy and Wales [10 and 24 February]. There was slightly more encouraging news on the fitness of Tadhg Furlong who was withdrawn for a Head Injury Assessment at half-time of Saturday’s game, but an elbow problem he picked up against the northern province will be assessed later in the week. Joe Schmidt was left sweating over Furlong’s fitness when he stayed down holding his arm during the first half on Saturday and although he continued until the interval, the prop has been treated for a hyper extension of his left elbow. James Tracy, meanwhile, suffered a dislocated elbow against Ulster and will see a specialist later in the week, while Adam Byrne’s comeback from injury has suffered a setback after his knee flared up. Sean O’Brien is also now unlikely to be fit in time for Sunday’s visit of Glasgow [KO 1pm, Sky Sports] as he continues to manage hip soreness. On a positive note, Rory O’Loughlin, Dan Leavy and Richardt Strauss are due back in training this week and are expected to be available for selection for this weekend. Joey Carbery has returned to full contact training and James Ryan (ankle) continues to rehab while there was no update issues on Rhys Ruddock (hamstring), James Heaslip (lower back) and Tom Daly (knee). Email “Ringrose a doubt for Ireland's Six Nations campaign after undergoing ankle surgery”. Feedback on “Ringrose a doubt for Ireland's Six Nations campaign after undergoing ankle surgery”.